I had started on a post entitled "Welcome to 2011". Unfortunately it sat in my drafts box for two weeks unfinished. Now it doesn't really seem appropriate to be posting New Year's greetings...being that we're almost to the end of the beginning of 2011. That is to say we're past the middle, which is nearer to the end than the beginning. You may have noticed (or not) that posting around the Cookie blog have been some what sporadic this past year. It's safe to say that my contribution to the world of crafty goodness has been minimal (I think I've managed about 2 scrapbook layouts, and I'm still working on the only crochet project that I started all year). The focus of my energies and of my free (hah!) time over the last 12 months change dramatically from always filling my time with something crafty, to always filling my time with something fitness related. That's right. I became a fitness bore. In particular? I became (and still am) a KARATE bore! If any of you have dared wander over to the dark side the Cookie Family Karate blog then you'll know that since I took up a place at Grace's karate school last November I've been working hard at my karate training and at uncovering information about the whole new world that is Martial Arts. I've recently moved all my crafty supplies out of our conservatory (what was my craft room, but did indeed prove to be way too damp a place to keep anything paper related) and into our new insulated/boarded out loft space. I could protentially craft up there if it came to it, but if I'm being honest with myself I don't see me getting back to regular crafting any time soon. Instead, my focus for most my time will be on family, on home, on work, on finances (and getting us through the financial crisis in something resembling one piece!) and my free time (what there is of it) will continue to be focused on fitness, and on karate (never thought you'd here my saying that...in a million years!). I will try to post more often on here but it will most likely be family stuff rather than crafty stuff. Although the stuff my kids get up to is enough to keep anyone amused, I'm sure. I've managed to progress up to blue belt/red tip in my karate school this year. I work hard training 2 days a week (soon to be three - hurrah) and putting in time training at home with Kendo. I'm looking forward to seeing more progress this year. To continuing to get better in all areas of my karate studies, to improve as an instructor (I've been assisting with Grace's class which I just love) and maybe (hopefully?) seeing some more gradings under (on?) by belt before the year is out. So. That's it for now. 2011 in Cookie blog land is the year of focus. Welcome to 2011 (a little late). I don't care what you blog about, I just like to be nosey and know what you're up to! 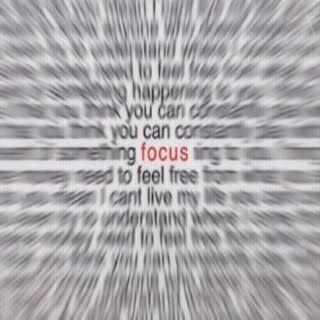 And that focus text picture made me feel sick! Well done you! Keep up the good work. I have no such valid excuse for not blogging much last year - only that I was far too busy!